With an enormous growth of 52% year-over-year in Q1 of 2016, Google Shopping has become a hot ticket item for all eCommerce stores. Merchants use it to promote their inventory, drive quality traffic to their online stores and increase overall sales. This year, the service is bound to become even more prominent, since is expanding to 14 new countries. Which type of feed should I submit? What are the feed specifications for each feed? How often should each feed type be updated? 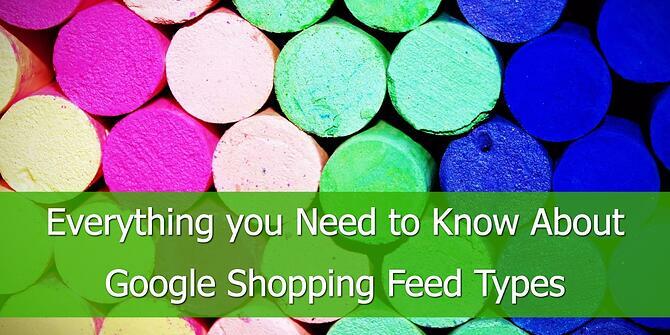 When to use which feed? All these questions and more are covered below. Main Scope: This is the main feed that contains all the information about your product catalogue that will be sent out to Google Merchant Center. It must be uploaded in an .XML or .TXT format. It’s mandatory for this Google Shopping feed to contain these fields: id, title, description, link, image_link, price, condition, availability, brand, and google_product_category. For apparel retailers the required fields also include: age_group, gender, color, size, material, and pattern. 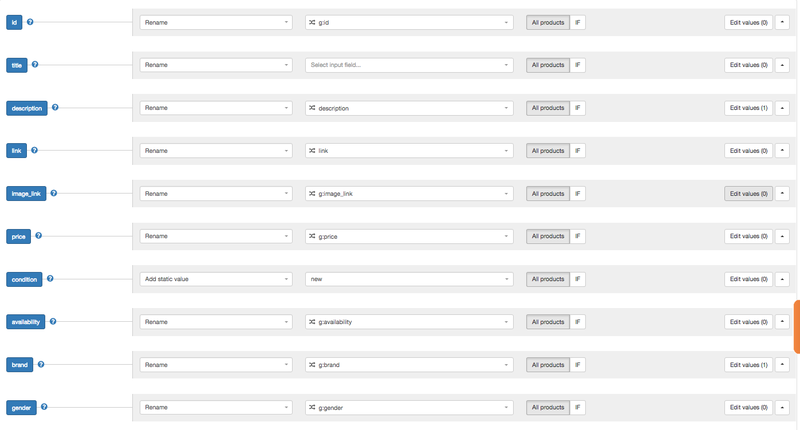 Before you create the feed, make sure to check the comprehensive list of required and optional fields. It’s the safest way to make sure the feed is in line with all of Google’s requirements. It is important that all products with a Global Trade Item Numbers assigned by the manufacturer, have the GTIN included in the feed. How often should you send feed updates to Google Merchant Center? The requirement is at least once a month, but we advise to have at least a daily update. If your feed changes often then you can consider uploading it up to 4 times a day. The online inventory product update feed allows merchants to change price, availability and the selling price for items previously submitted, via the regular Google Merchant feed. The online inventory update feed is a useful tool if the price or availability of the products changes frequently. 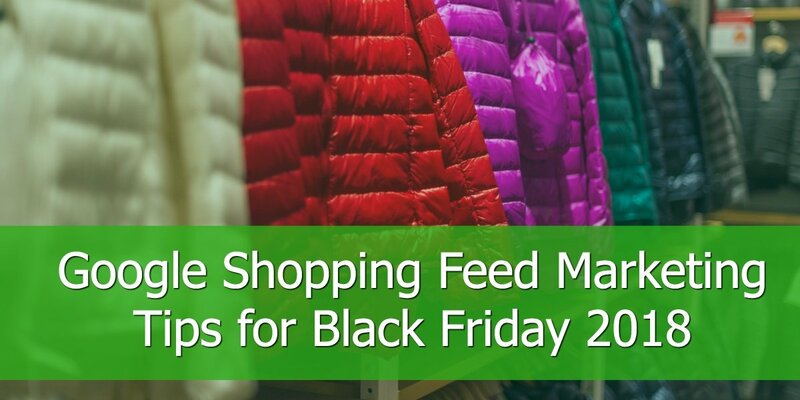 Through it, retailers can quickly propagate updates to a regular feed, instead of updating the main one. The feed contains only 5 fields: id, price, availability, sale price, and sale price effective date. Of course, the value of a product’s id field must match the id value from the regular Google Merchant feed. Online inventory product update feeds can be submitted as often as the merchants needs to, throughout the day. 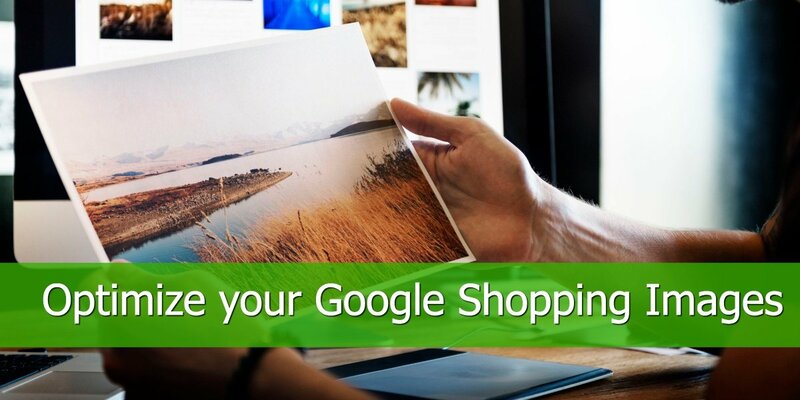 Merchants can use the Google Promotions Feed to add boost the CTRs of their listing ads on Google Shopping. Currently the service is available in a limited number of countries: Australia, France, Germany, India, UK and US. The program is going to be made available to other countries and you can check on their Merchant Promotions page to see if your country has been added to the list. In order to use Promotions feed, merchants have to submit a Merchant Promotions Interest Form. Once your Google promotions application is approved, there will be an extra feed type to choose in the GMC. 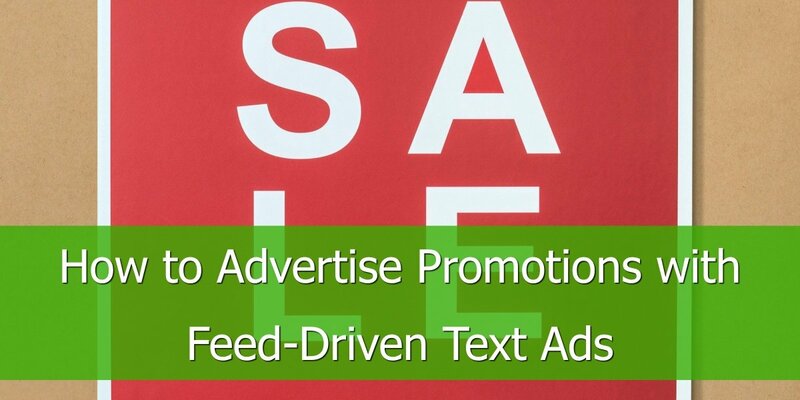 The promotions feed has 6 required fields: promotion_id, product_applicability, offer_type, long_title, promotion_effective_dates and redemption_channel. Scope: Google’s Local Inventory Ads are designed to help brick-and-mortar stores direct foot traffic to their physical stores. Local shoppers can view online inventory, working hours and directions to reach shops. Google Local Inventory Ads is a great way for eRetailers to significantly increase offline sales. To take advantage of the opportunities offered by Local Inventory Ads, merchants have to create 3 additional feeds, with the list of all the products they sell in stores. Business information feed - will list the information regarding all your business locations. Google Local Products Feed - this feed will include information about the products you sell only in-store or both online and in-store. Google Local Product Inventory Feed - will include stock information and price for each physical location. 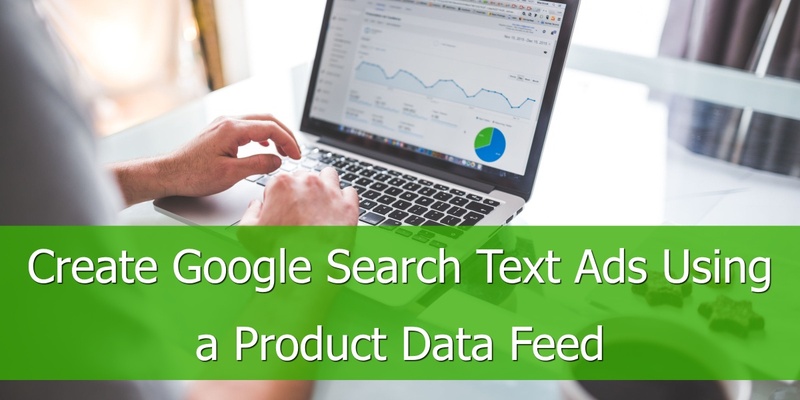 Matching the four data feeds: Google Business Locations, Google Local Products Feed, Google Local Product Inventory Feed and Google Products Feed will be done automatically by Google via the ''item_id'' attribute. How often should you submit these feeds? Local product inventory feed – at least once a day. Scope: Adding Product Ratings to the listings to build trust with potential buyers and increase sales. by submiting them via a third party review aggregator. If the second option is preferred, Google will get the data directly from the aggregators and there will be no need for the merchant to submit the feed. However, if reviews are collected via the retailer's website, then creating a Google Product Rating Feed is necessary. The updated feed needs to be submited at least once per month. Otherwise, the document might contain potentially inaccurate data, which is not relevant for shoppers. Failing to comply with this requirement can lead to your ineligibility to participate in the Product Ratings program. One last thing: you must have at least 50 reviews for ratings to be displayed on your product listings in Google Shopping. Scope: Retarget shoppers that visited a product page or abandoned a shopping cart. This will help with your eCommerce remarketing efforts and you can display tailored ads to past visitors, based on their activity on your website. There are a few steps you need to take on order to use dynamic remarketing. First of all, you have to submit your regular feed to Google Merchant, in an .XML or .TXT format. Optionally, you can also add some additional fields to the document: display_ads_id, display_ads_similar_id, display_ads_title, display_ads_link, display_ads_value, excluded_destination, adwords_grouping, adwords_labels. 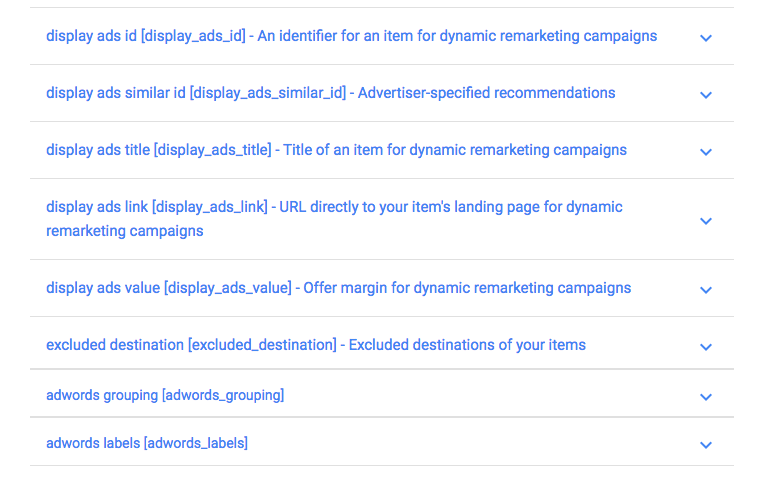 Once your feed has been validated, you can create a dynamic remarketing campaign via AdWords. Scope: Gives more control to brand manufacturers and brand owners as to how their products are presented to shoppers on Google Shopping and other Google services. With Google Manufacturer Center manufacturers can improve their presence on Google, by providing rich, accurate and standardized content, to shoppers and retailers alike. There are 6 compulsory fields: id, gtin, title, description, image link and brand. However, you shouldn’t stop here. It’s recommended you fill in additional attributes, since it will allow shoppers to search and find your products more easily. It’s worth mentioning that you can upload test feeds, to find and review potential errors. Such feeds do not create items eligible for Google Shopping results. Finally, keep in mind that you need a separate feed for each country where you submit products and you can have up to a maximum of 20 feeds per country. Google Shopping is an excellent channel for getting your products in front of a large audience, and a way you can attract more customers. We hope this article will help you better understand what type of product information you have to submit to Google, depending on your eRetail objectives.